Audiology is the science of hearing and balance and their associated disorders. It’s a varied and expanding discipline, involving aspects of biological sciences, psychology, physics and electronics, speech and language development and social science. As an audiologist you will be involved in the diagnosis of and rehabilitation of patients, allowing you to develop relationships with your patients and see the benefits they get from your care. Audiologists must be able to communicate with people of all ages and combine logical thinking and a scientific approach with a caring and patient-focused attitude. We offer excellent clinical placement experiences across our region which provide opportunities for you to experience the varied work of an audiologist. The course has an excellent employability record. 100% of our Audiology students are in work and/or studying six months following graduation. You will be taught by experienced qualified professionals and being part of the School of Medicine strengthens our link between academic expertise and world-leading research. On successful completion of this course, you will be eligible to apply for the Registration Council for Clinical Physiologists (RCCP). The course is also accredited by the National School of Healthcare Science (NSHCS). In year 1 you’ll gain a broad understanding of the principles of neurophysiological healthcare science, with an introduction to the theory and practice of audiological assessment and rehabilitation. You’ll start to learn how to assess hearing function in the on-site clinical laboratories prior to using these skills on clinical placement. You’ll also learn about professional working and you will start to develop your independent and critical thinking skills. 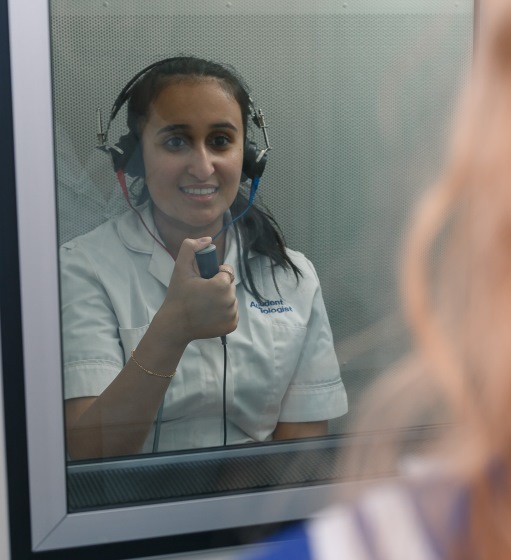 In year 2 you’ll learn about a range of audiological assessment and rehabilitation techniques, preparing you for your longer clinical placement at the end of the academic year. In particular, you’ll focus on adult hearing impairment and the current technological and non-technological options to improve the quality of life for hearing impaired individuals. You’ll undertake an NHS clinical placement at the end of this year, where you’ll continue to develop your audiological skills. In year 3 you’ll explore more deeply a wide range of hearing and balance disorders and the options available to treat and manage these conditions. You’ll also conduct a research project in one particular area of audiology. You’ll continue to develop your practical skills both in the on-site clinical laboratories and also in your final clinical placement in semester 2 of this year. Throughout the course, you’ll develop the skills necessary to become an audiologist, but you’ll also gain more general skills. These include critical thinking, problem solving, independent learning, scientific enquiry, professional working and reflective practice. Methods of training are highly participative, with a combination of tutor-led input and support, learning through group work and discussion, and individual exercises and practice. The audiology labs in the School of Healthcare provide a state-of-the-art environment for audiological teaching and research. They comprise 3 teaching labs, all of which are equipped with cutting-edge technology used in the diagnosis and rehabilitation of hearing and balance conditions. Our sound-proofed research labs house a wide range of equipment that allows the investigation of a number of research questions. These include a set-up for testing people’s ability to simultaneously perform sound-localisation and postural control tasks and equipment for making physiological, psychophysical and electroacoustic measurements. Alongside these dedicated facilities in the newly renovated School of Medicine building is the Medical Teaching Centre and the Health Sciences Library. You'll also have access to the Clinical Practice Centre at St James's University Hospital, which allows you to gain clinical skills prior to placement and in a hospital environment. We use a range of assessment methods to assess your clinical and professional skills. These include presentations, group assessments, unseen examinations, OSCEs (Objective Structured Clinical Examinations), along with essays, a final oral examination and the grading of clinical practice. You’ll need to demonstrate the knowledge and application of standard concepts, information and techniques relevant to the discipline, as well as your emerging abilities, skills and competencies. You need to be able to draw on a wide variety of material and be able to evaluate and criticise received opinion. 45 credits at level 3, which must be at distinction and include 15 credits from science subjects + GCSEs, as above. We strongly advise you to contact the School to discuss the suitability of your chosen Access course. We consider Access Courses to be suitable for mature applicants, who have been out of full-time education and have had no previous access to higher education. We will consider applications on an individual basis. Health and Social Care qualifications have insufficient science content and will only be considered with an additional science A level – biology, human biology, chemistry, maths, physics or psychology. The School of Medicine does not normally participate in the UCAS Extra scheme for entry onto the Healthcare Sciences (Audiology) BSc degree course. You must tell us in your UCAS application if you want to defer entry and if you have any prior criminal convictions. Shortlisted applicants are normally invited for multiple mini interviews at the School of Medicine. This allows us to further assess your aptitude for, and interest in, the course. It’s also an opportunity for you to visit the audiology facilities, find out more about the course and meet staff, students, patients and carers. Career opportunities in audiology are excellent both within the UK and around the world. Approximately one person in ten is affected by a hearing impairment, so demand for hearing assessment and rehabilitation services is very high. This demand is expected to increase as the population ages. In the UK the NHS employs the majority of audiologists, in a range of settings and a variety of roles. Settings include hospital Ear, Nose and Throat departments, self-contained audiology centres and educational establishments. A number of audiologists also work as independent practitioners in private practice. Audiologists select the assessment methods and rehabilitation techniques most appropriate to patients and their needs, within the setting and available resources. In addition to assessment and treatment, audiologist roles can also include consultant, counsellor, advisor, educator, facilitator, researcher and therapist. We have excellent and well-established work placements, where you'll gain clinical training in established NHS audiology departments, primarily within the Yorkshire and Humber region. Find out more about our clinical placements.